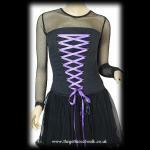 An unusual long length black top made from soft stretchy cotton with a purple leopard corset print giving the impression that you are wearing a corset. The upper bodice is made from soft black lace with a band of rivets below and the back has a keyhole cut-out in between the lace and the lower back. The double shoulder straps have adjustable buckles and the lower hem has a wide band of black lace.